As one of the buzziest superfoods of the past several years, quinoa has somehow managed to remain largely shrouded in mystery. Even its origins are indeed mythic: According to the Food and Agricultural Organization of the U.N., quinoa was first cultivated in the ancient Andes—specifically the geographic regions that are now Peru and Bolivia—possibly as long as 7000 years ago. Today, it’s become the cornerstone of veggie-based breakfasts, vegan bowls, and so much more—and with good reason. This beloved food is not only tasty and versatile, but it also packs a major nutritional punch. Read on for your essential guide to what quinoa is and why you should be eating it right now. Often referred to as a grain or even as a “super-grain,” quinoa is neither. Classified as a pseudocereal or pseudograin, quinoa is plant-derived and is far more closely related to the food family that includes beets, spinach, and chard. While there are well over a hundred varieties of quinoa, only three types are regularly used for consumption: black, white, and red. The most popular of these is arguably red quinoa, which is rich and nutty in flavor and can be cooked similarly to rice. While quinoa is technically a seed rather than a grain, it's often described as a “whole-grain” because of its exceptionally balanced nutritional content. Quinoa is extremely high in nutritional content. Remarkably high in protein, quinoa also includes a complete amino acid complex, which means that it’s great for energy and metabolic health. High fiber, vitamin E, and iron earn extra nutritional bonus points. Quinoa is gluten-free. Part of figuring out what quinoa is involves taking a look at what quinoa is not. Whether you’re gluten-intolerant or simply trying to cut back, quinoa is a terrific alternative to gluten-heavy grains like wheat and barley. Quinoa goes with everything. Like your favorite black handbag, quinoa is a match for just about everything. Try it with goat cheese, arugula, and squash for a light and easy seasonal salad, or bake it into your favorite muffins and bars for a simple on-the-go breakfast. Quinoa includes rare (and valuable) plant compounds. Some of quinoa’s most attractive components are even more mysterious than quinoa itself. Quercetin and kaempferol are two such components, and have been shown to be anti-inflammatory and contain cancer-fighting properties. 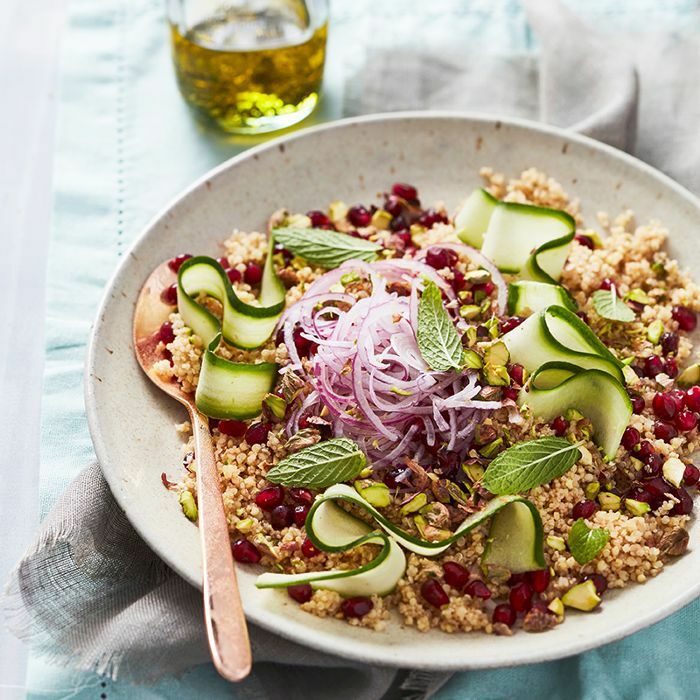 Now that you know what quinoa is (and a few of its key benefits), it’s time to shake up your grocery list and take your cooking itinerary to the next level. Up next, keep reading for our handy grain glossary of when to cook with farro, quinoa, rice, and more.